Though the Amazon Prime Day saw an onslaught of discount offers, it seems like the e-commerce giant isn’t done treating its Indian users just yet. Amazon India has today announced the ‘Amazon Freedom Sale’ to celebrate the country’s Independence. It will kick off at 12:00 am on August 9 and is going to run until 11:59 p.m on August 12. The Freedom sale will go live within the next six days and the e-commerce giant claims to offer hefty discounts (over 20,000 deals) on a range of products from the likes of close to 2500 brands such as OnePlus, Honor, Samsung, Dyson and others. You can also expect to witness 100+ new product launches during the sale, so do keep your eyes peeled. 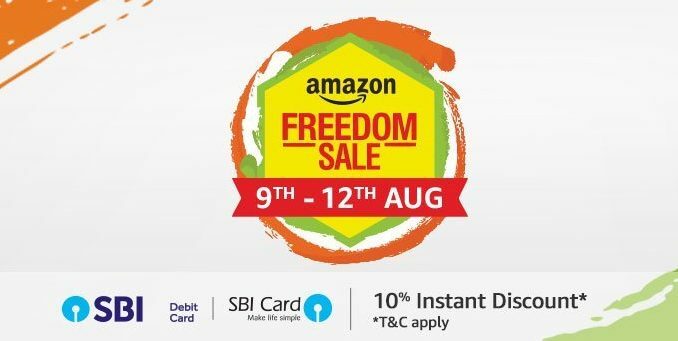 Amazon India has already created a landing page for the ‘Freedom Sale’ and it highlights that the e-tailer has partnered with the State Bank of India to offer an additional 10% cashback to users checking out with SBI credit/ debit cards. There will surely be a limit on this cashback but that hasn’t been disclosed just yet. The landing page further gives us a sneak peek at the expected price cuts and offers we will see during the sale. We no doubt expect hefty price cuts on the Amazon Echo smart speaker and Kindle e-reader lineup, as usual. But it has also been revealed that Amazon India will offer up to 40% discount on mobile phones and accessories, along with up to 50% discounts in the electronics segment. As you can see in the image above, the e-tailer giant is also teasing the discounted prices for many phones, such as the Huawei P20 Lite, Honor 7C, Realme 1, along with additional exchange offers on devices such as the oh-so-popular OnePlus 6, Moto G6, Galaxy Note 8 among several others. No specific details for the offers on mobile devices, or electronic appliances are available just yet, so don’t forget to circle back to Beebom.com for more updates.